Yes, that’s right! I got my school teaching placement!! I didn’t have to wait until mid-July as I was originally anticipating. In fact, it only took about a week an a half from getting my regional placement. I will be the North American Language & Cultural Assistant, or auxiliar de conversación, at C.E.I.P San Miguel in Almuñécar, Granada, Spain. It’s a primary school located in Almuñécar, which is right on the Costa Tropical in Andalusia looking out on the Mediterranean Sea. Being located right on the Mediterranean, Almuñécar has roughly 26,000 residents, which swells to around 150,000 during the summer months because of vacationers from Spain and northern Europe. 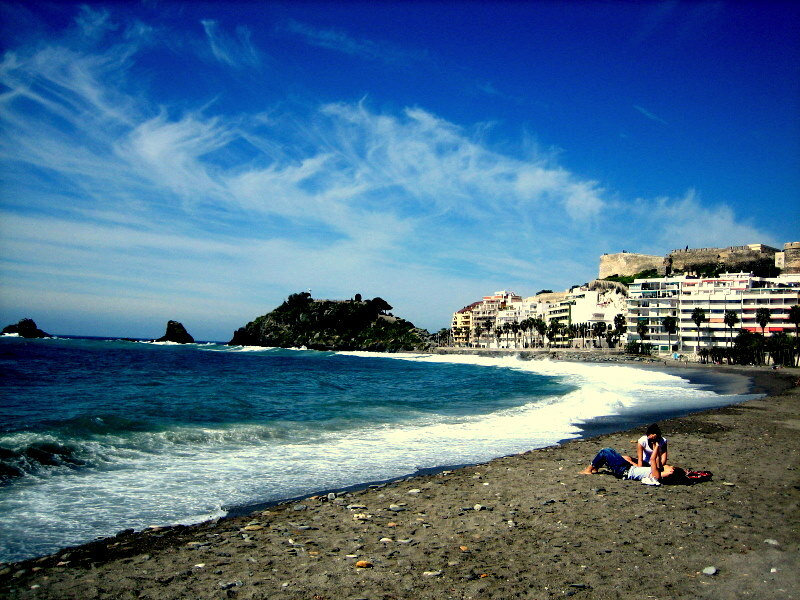 Just to the east is Salobreña (12,500) and Motril (59,000), and Nerja (22,000) is located just to the west. Málaga is a 60 minute drive west, while Granada is a 60 minute drive north. Almuñécar has a comfortable average winter temperature of 15 Celsius (59 Fahrenheit), which would be a welcome changed from Wisconsin’s long, cold winters. There is a large castle, Castillo de San Miguel, that’s up high on a cliff over looking the city, beach, and sea, and a Roman aqueduct about 1 mile north of Almuñécar. A fun historical note is that Almuñécar used to be called Sexi when it was a Phoenician city (thank you for this fact Trevor Huxham). Aside from the Phoenicians, it also has been influenced by the Visigoths, Muslims, and Christians throughout history. It’s on the freaking Mediterranean!! *Almuñécar may give me a better chance to improve my Spanish as there would be less Americans around, but there is a strong northern European influence in the area (British, German, Dutch, French,…) because of tourism, which could lead to me using less Spanish and getting a less “Spanish” experience. I suppose it’s all relative in how hard you try to speak the language and become integrated though. 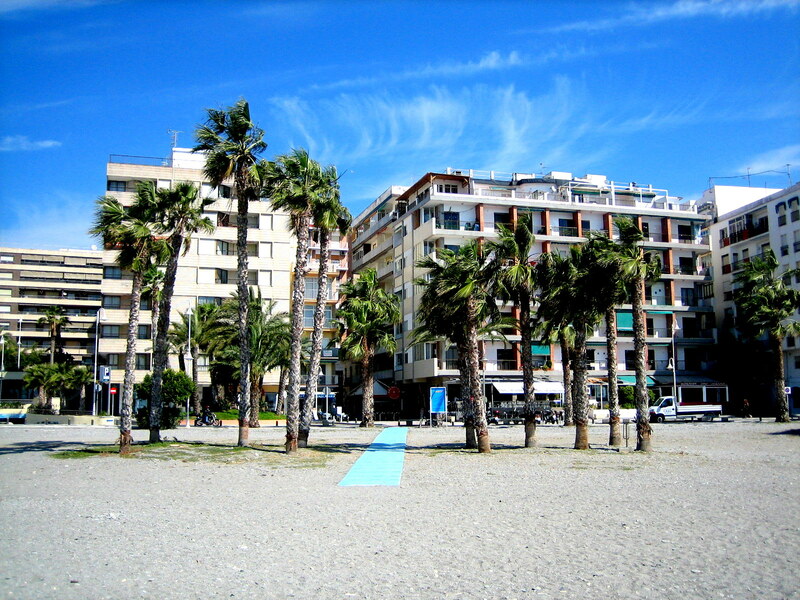 Oh yes, there is Málaga too, which I am not against, but would be my third choice as of now. It could be because I only visited on a day trip, and it was gloomy and rainy. What I’ve decided as of now, on a whole 24 hours of thinking mind you, is to simply try and contact my school to see what the teachers there do. Do they live in Granada, Malaga, Almuñécar, or elsewhere? Is it possible to carpool with them or would I need to rely on the bus? Essentially the answer to these questions would be the biggest determining factor in my decision. While I’m getting antsy and excited about this whole decision because I finally know the area I’ll be in, I also know it’s still about 4 months off and I have plenty of time to decide on my exact whereabouts. Have you been to Almuñécar? What did you think of it? Do you have a recommendation on where I should live? ← I Will Be Teaching in Andalucía! Although it’s a difficult choice, I feel like I really can’t go wrong! Live in your placement city! Lucky!!!! I hate winter so your lucky that you live in a warmer climate. Also lucky that Andulucia has been on the ball. I will live in Madrid and we haven’t heard anything todavia. Thank you! I’m sure you will hear from Madrid soon. My fingers are crossed for a quick placement for you. Haha thank you Julia! I’m biased towards Granada too, so you are not the only one. I’m thinking that I’ll try and get there early so I can visit and explore Almuñécar and Granada. This way I can also see how long the bus ride is between the two. I visited Almuñécar when I was studying in Granada, but our bus broke down halfway so the ride wasn’t your typical ride. Wherever I end up deciding to live, you’ll be welcome to visit! Thanks! And you to Madrid! Hola, mi nombre es Jacinto y soy de Granada, Si vas a estar un año por aqui, vas a tener tiempo de decidir con tranquilidad, Almuñecar es bonito y con buen tiempo tiene muy buen ambiente y si no te llena el ambiente siempre puedes decidir Granada mas tarde. De todas formas te informo que para este año terminan la autovia del mediterraneo (creo que en octubre), De Granada a Almuñecar habrá sobre unos 75 Km, por lo tanto se reduce bastante el tiempo de desplazamiento. En automovil particular se tardara sobre unos 40 minutos. Congratulations!! (And thanks for the shoutout tehehe) If I were in your shoes, I’d live in Almuñécar. Personally, being on the road 2 hours each day would be too much for me to handle—that’s almost 13% of your daily waking hours!—and I feel like a pueblo larger than 20,000 or 25,000 people is big “enough” to not feel trapped in. Also, you’d be on the beach!!!!! And you’d be able to get private English lessons with students you already teach and know from school. Plus, Granada’s always just an hour away for weekend jaunts. Úbeda where I’m at this year has 35,000 and I’ve really enjoyed the mid-sized pueblo life (although to be honest I’m looking forward to 100,000-strong Santiago de Compostela next year hehe). Hopefully Almuñécar will be less “touristy” during the school year than during the summer—that’s INSANE how much the population explodes in July/August! Thanks Trevor. I’m strongly leaning towards Almuñécar right now, barring any advice from my school. I didn’t even think about private lessons for my students! That would be an amazing opportunity. I’m sure I’ll be going to Granada and Malaga for many weekend jaunts seeing as both are an hour away. It’s far from Santiago de Compostela, but I’d still like to try and visit. I definitely agree…I am living in Sevilla and my pueblo is only 15 minutes away by metro, but I am kicking myself for not living there instead. Honestly, you can have the best of both worlds if you live in Almuñécar, you can improve your Spanish, really get to know Spanish culture, and run off to Granada for the weekends. In hindsight, it is what I should have done, since I spend almost all of my time out here in Mairena anyway! Thank you! That’s very helpful in making my decision, and living in Almuñécar is honestly the way I’m strongly leaning. Congrats on your placement! I hope Madrid gets on the ball soon… Personally, I’d live in Almuñécar in your situation, but remember, you can always move from one to the other in the middle of the year if the commute or smaller city gets to be too much! That’s a very good point Jessica! Hopefully you hear soon. I’m guessing what all the placements will come at once. Thanks! I’m guessing that all the Madrid placements will come in one wave. That’s sort of how the Andalusia ones went at least. I’m looking forward to finding out where you will be placed. I’ve never lived near a coast…unless you count Lake Michigan, which I don’t! This coastal living will be a totally new experience for me. So I got my school placement today! I’m at a colegio in Getafe, a city about 13km south of metropolitan Madrid. It’s great because I can definitely commute from the center 🙂 Have you decided where you will be living yet, or at least working along on which is the best fit for you? Congratulations! I’m not overly familiar with Madrid’s geography, but it sounds like you’ve got a great placement! I am fairly certain I will be living in Almuñécar. I emailed my school and the director was very responsive. He said that most of the teachers live there, and only a few commute. My plan is to get there a little early and explore to see if I really want to live there or not. I’m strongly leaning towards it though. Greetings, Mike, from one cheesehead to another. I haven’t seen it mentioned so forgive me if you already know, but you should definitely check out the Wagoners blog (http://wagonersabroad.com/). They are an American family of 4 that upped and moved from North Carolina to Almuñécar and are sending their elementary-aged kids to public school there. They just finished their first year and I think plan to stay for another. I’ve been in contact with them and I’m sure they’d answer any questions you may have (great folks). Good luck on your journey. Thank you very much for referring me to their blog! It’s been pretty informative so far and I’ll definitely be contacting them. It’s always nice to hear for another cheesehead! Hey Mike, looked you up after you contacted us. Let me just say that there are too many Americans in Granada. Nothing against “us”, but we have been in Almuñécar nearly 1 year and have only met one other American couple. There is another American lady that recently contacted us, living here too. So we will meet with her upon our return from Summer travels. Thanks Heidi! 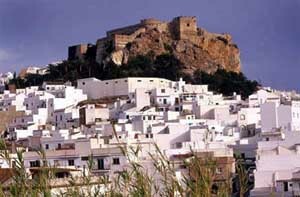 I have decided to live in Almuñécar for many of the same reasons you listed. I’m looking forward to meeting you once I’m there! Thanks Josh! I have decided to live in Almuñécar. I figure it’ll be less time commuting and will give me a better chance to get private classes since I’ll be working in the city I will be living in. Now, I just need to find a place to stay when I visit Granada.